Roger Hudson visits the Belfast shipyard in 1911, where the Titanic and her sister ships, Britannic and Olympic were constructed. 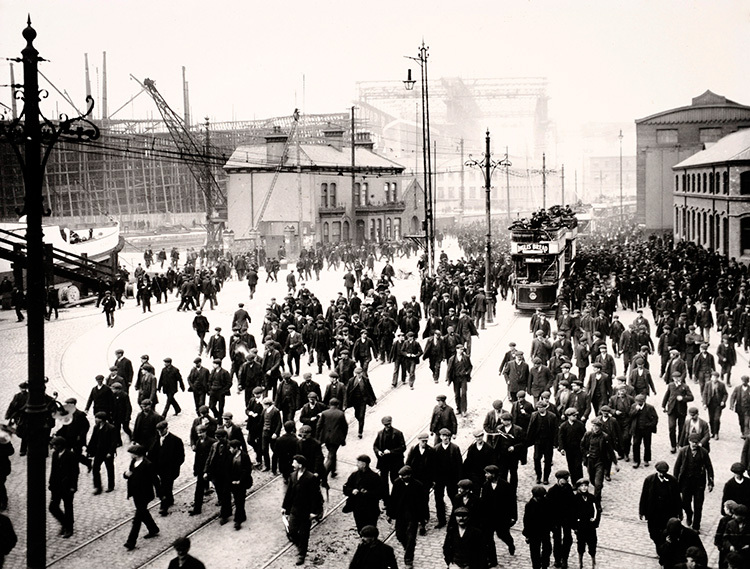 Workers go home after their shift in the Harland & Wolff shipyard, Belfast, in May 1911, cloth caps on every head and not a hard hat to be seen. There is a string of trams waiting for those who live further away and in the far distance the hull of the mighty Titanic can be discerned, under the gantry crane specially built for the construction, side by side, of her and her sister ship, Olympic. Already launched, the Olympic is being fitted out nearby, ready for its maiden voyage. Titanic will be launched at the end of May. The decision by the White Star Line to build three new ships, so that it could maintain its share of transatlantic passenger traffic against the competition coming from the Germans and from Cunard’s Mauretania and Lusitania, was taken in 1908 with the backing of J.P. Morgan, who controlled White Star’s parent corporation. Cunard went for speed while White Star went for size, with Titanic and her sister ships weighing in at around 46,000 tons. Belfast could cope, since it had the largest shipyards in the world at that time, in spite of all coal and iron having to be imported, though Sir William Arrol & Co’s giant gantry had to be installed. Arrol was up to the challenge, too: using his new hydraulic riveting technique he had built the Forth Bridge and much of Tower Bridge. Out of the total Harland & Wolff workforce of 15,000, about 4,000 worked on Titanic, nearly every one of them Protestant and so Ulster Unionists, determined to fight Irish Home Rule, even to take up arms in a year or two, when it seemed it might be forced on them. The story of Titanic’s first and last voyage in April 1912 does not need retelling but that of her sister ships Olympic and Britannic (launched in 1914) is worth recalling. Britannic became a hospital ship and was sunk by a mine in the Mediterranean in 1916; though she was the largest ship sunk in the war, only 30 lives were lost. Olympic became an armed troopship and in 1918 sank a German submarine. After the war she continued ploughing back and forth across the Atlantic and was eventually withdrawn from service in 1935. There is another largely forgotten story, which perhaps helps to keep Titanic’s in some sort of perspective. In May 1914 the 14,000-ton Empress of Ireland, pride of the Canadian Pacific’s White Empress Fleet, left Quebec for Liverpool. In the St Laurence River she saw approaching a 6,000-ton Norwegian collier before it disappeared into a fog bank. She stopped and kept sounding her fog horn, only for the collier to reappear and drive straight into her side, between her two funnels. The Empress sank within a quarter of an hour with just over 1,000 lives lost, not a match for the more than 1,500 who went down with Titanic, but close enough to be spoken of in the same breath. As for Harland & Wolff, its main business now is offshore wind power, while the Titanic Belfast Visitor Attraction opened on the site of the shipyard in 2012.